It's 7.30pm on Monday night. The theatre lights are like spots on Suzi as she lies next to me on the hospital bed. I'm sitting on a small plastic chair wearing blue scrubs and we both have oversized hairnets on. We're holding hands. Duffy's on the radio and I have a fleeting thought of 'what happened to her?'. This scene is so far removed from the visualisations we have had about this moment. But as we hold hands, all we feel is an overwhelming excitement to meet our little Olive. 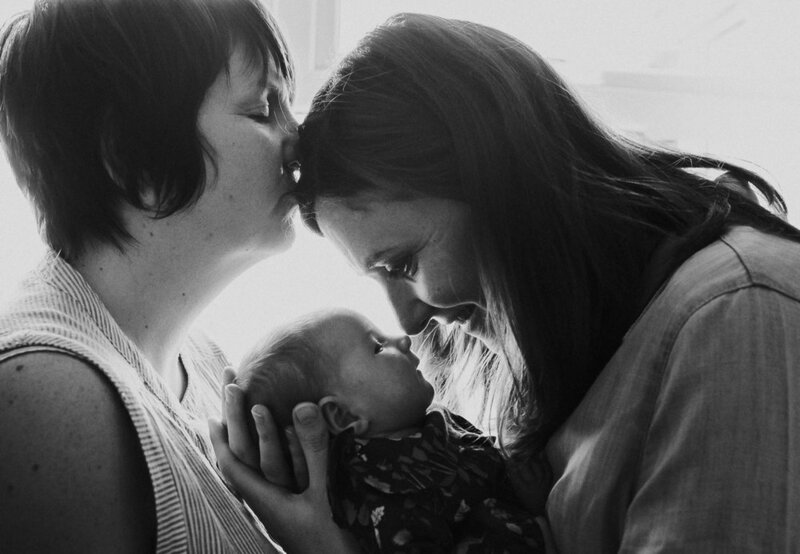 We wanted to share our story, to talk about how we'd seen the birth and what actually happened, and that even though there was more medical intervention than we'd envisaged, we still held onto elements of control. We didn't know a year ago that the first birth story we'd capture would be our own! We took time to think about whether we wanted to do it, but we really wanted this massive chapter in our lives to be documented in photos and in film (more of that soon!). Suzi wrote a birth plan quite early on. We initially toyed with the idea of a home birth. Our comforts around us, toast and tea on tap, music, soft lighting. But then we worried a little about our cat Delboy getting too close to the birthing pool with his sharp claws. I know this anxiety was probably just telling us we weren't 100% comfortable with doing this at home. So after we'd looked around the Birthing Centre (adjoined to the hospital), this really felt like the perfect option. We now had a place to visualise when we thought about the birth. The midwife that showed us around was lovely and she told us about little things, like photographs, that we could bring from home, and it made us feel much more comfortable. As the weeks passed, we clung onto that thought. Our consultant advised that we should be thinking about induction, but as Suzi had had a healthy pregnancy, we wanted to wait longer. We reached our estimated due date of 31st July. We were both on tenterhooks waiting for any signs that Olive might want to make an appearance. We tried to keep active and get out for short walks. Days and nights passed. It was a strange feeling, between two worlds. During the nights, any movement from Suzi would spring me bolt upright in bed, but there was no sign. Suzi and baby were being monitored every couple of days. The friendly faces of the midwives welcomed us once again at the maternity assessment centre. They were so reassuring, but these trips were taking their toll. We know that Olive was just taking her time, but every day past the due date went by so slowly. So, over the weekend, Suzi made the decision to be induced. Our bags had been packed weeks before and were already in the boot of the car. We grabbed a bag full of snacks, and just as we were doing a check of the kitchen and topping up the cat's food, we noticed the fairy lights in a clump on top of the stereo. We remembered the midwife in the birthing centre saying we could make our room look cosy and homely, so in the bag they went. We had a last check around the house and both felt so excited about the next time we'd be here. After the first part of the induction process, we settled into our room on the ward. I'd set up the fairy lights at the end of Suzi's bed. At this point, we want to talk about hypnobirthing, and how it became an integral part of both Suzi's and my journey in the run up to birth. In the months leading up to this moment, we had had training with Divine Hypnobirthing in Hebden Bridge. We can't recommend Sophia highly enough. It helped us so much to give us the space both physically and mentally to remain relaxed, calm and in control. We both put what we had learnt into practice over the coming hours. At 3pm in the afternoon, Suzi's waters broke. It wasn't quite as dramatic as I had in my head, but I remember this intense excitement we had that we were one step closer to meeting our Olive. And then a couple of hours after this, Suzi's contractions started. They intensified quite quickly. Olive's heart rate was a little faster than it had been, so we were taken down to the labour ward to be monitored. I set up the fairly lights in the corner of the room and dabbed a few drops of clary sage on a tissue. The midwives through the night commented on the relaxed atmosphere in our room. Suzi asked if the birthing pool was free. I think we both probably knew that Olive wouldn't be born here, as we still had a way to go, but just seeing Suzi in the water, and knowing that this was a big part of her birth plan, it filled my heart. I brought in our blue tooth speaker. Stevie Wonder and Sufjan Stevens drifted into the dimly lit room. After about an hour, the midwives recommended the next stage of the induction process, and Suze was hooked up to a drip which delivered syntocinon. This made the contractions much stronger. Inside, the sounds consisted of beeps and heartbeats, and trollies being wheeled in the corridor. Outside, I noticed night was slowly giving into day, the blue dawn light was creeping through a gap in the curtains. Toast and tea came, and our midwives changed shift. The next few hours seemed to pass in a haze. Texts to and from anxious parents, cups of Costa tea, gas and air, back rubs, brow mops, hand holding and repeat. At 3pm, 24 hours after Suzi's waters had broken, the doctor came to check on progress. 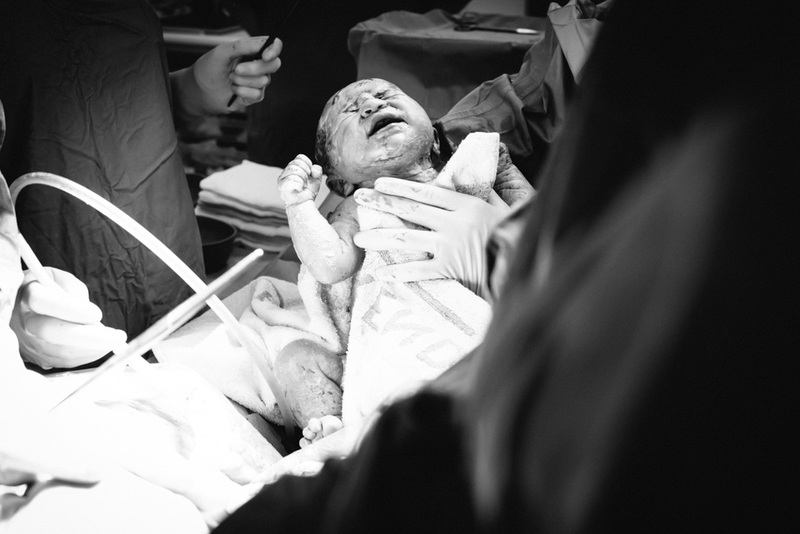 There hadn't been much change and it was the first time that a Caesarian section was mentioned. For the next 4 hours, Suzi remained calm and focussed, but her energy was really being zapped. 7pm came, and after more checks, Suzi agreed that a C-section was the best option at this time. And we really hold onto this feeling that it was the best for both Suzi and Olive. So here we were, Suzi lying calmly next to me and me sat on my blue plastic chair at 7.30pm with my scrubs on. Everyone in theatre had their place and role, I think I counted 12 people. They were all entering their names into the hat before we told them that she was going to be called Olive! The screen went up, Duffy was warbling on the radio and then suddenly one of the midwives said, 'Oh, I can see some hair!' A beat later, at 7.56pm, this beautiful scrunchy eyed, wrinkled little wonder was lifted into the light. Our first glance at our gorgeous Olive. They quickly wrapped her in towels and helped her with her first couple of breaths, then we heard some snuffles, and a cry echoed around the room. One of the midwives brought this little towelled bundle over to me whilst the doctors were stitching Suzi. I just held our little miracle in my hands and a tear dropped from my cheek onto hers. Her eyes were still so scrunched up under those big spotlights. During the pregnancy, there was one song we sang to baby bean bump throughout. I started to sing the first line of it, and Olive opened her eyes wide open and looked straight into mine. After our hug, Olive was placed next to Suzi and they just looked deep into each others eyes. Blimey, there were a few tears right then. Suzi and Olive were wheeled into the recovery room. I took my scrubs off and went to join them. The midwife had put a little woollen hat on Olive's head and she lay next to Suzi breastfeeding. Those little content sounds from under that little stripy hat led to yet more happy tears. Me and Suzi held hands in that brightly lit recovery room and we felt how perfect that moment was. Sometimes, there do seem to be some judgements and pressures around pregnancy, birth and feeding. We know in our hearts that we made the right decision for us at that time, felt fully in control of the situation and our choices, and we let go of any of those visualisations we had had previously. Thank you to our wonderful NHS for looking after us so very well, they really were incredible. The last thing that came out of the case when we arrived home were those fairly lights. They really were a calming cosy source for us over those hours in labour, and for the subsequent week spent in hospital. We know they're just a string of twinkly lights, but just having them there in the room with us was really significant. We're going to hang them in Olive's room, so when she moves in there in a few months, she'll have them to make her feel cosy and comforted too.